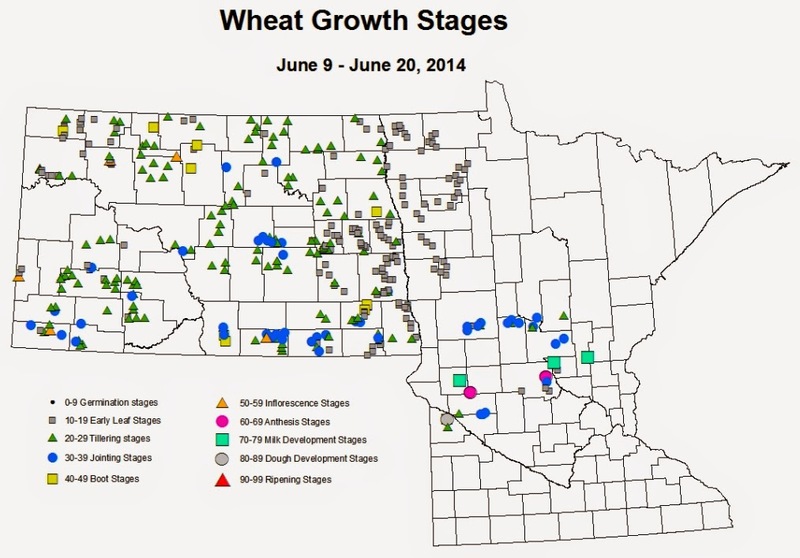 Crop growth stage maps from last week had fields across the NW region in the leaf to tillering stages. The map that will be published next week will show rapid progress, with fields in the joint - boot - flowering stages. The further south you go, the crop is flowering - milk stage, primarily the winter wheat. Bacterial leaf blight hasn't been a big concern, however Mr. Doug Holen is reporting BLB infecting wheat at the De Graff, MN variety plot site. More information later as better assessments are made. were most often associated with winter wheat. These infections were found before any detections of aphids in the region. 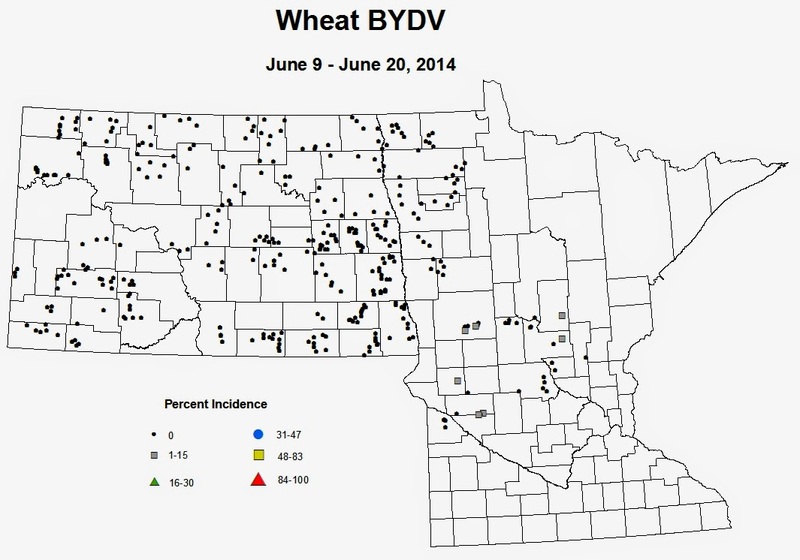 BYDV is transmitted to small grains by aphids. 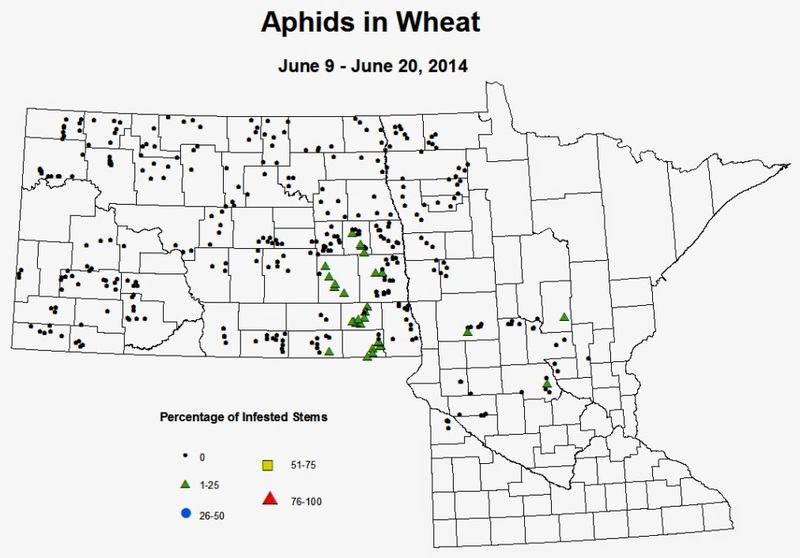 It is possible that winter wheat could have been infected in the fall by aphids in the region. If that is the case, watching winter wheat planting dates to avoid seeding to early would be advised. Cereal aphids began moving into the region and the number of fields found with low levels will increase this week. In general, the fields where we've seen reports in Minnnesota, the aphid infestation levels are below the treatment threshold of 85% infested stems. There were more fields with aphids in SE North Dakota. It is definitely time to include aphids on the scouting list. 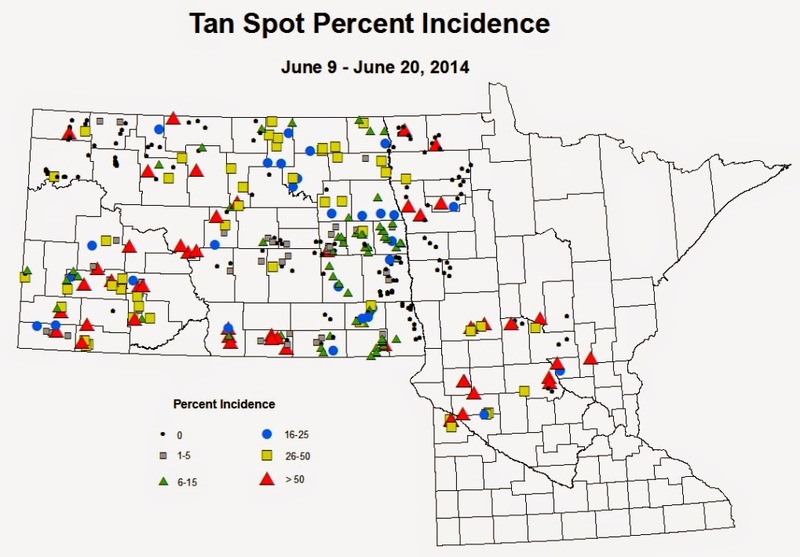 Tan spot is still the most prevalent small grain disease found in the region. To view other maps or access them at the IPM Survey link.